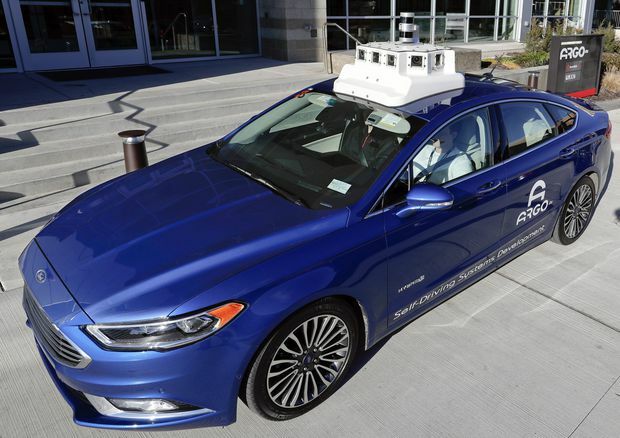 A test vehicle belonging to Argo AI, Ford's autonomous vehicle unit, is parked at the company offices in Pittsburgh. Global industries and governments are racing to bring self-driving vehicles to their streets and – just as importantly – competing to make the greatest strides to capture that market. Consulting giant KPMG’s Autonomous Vehicles Readiness Index, released on Feb. 12, rates major industrial countries on their ability to adopt self-driving vehicles en masse. The report weighs the melee of factors that go into putting autonomous vehicles, or AVs, on the road. It can be a confusing mix, from rapidly advancing technology to slow changes in consumer sentiment, government policy and major infrastructure renewal. The countries that ranked higher are those that had very clear, large-scale AV initiatives. In the report, clear policies and attention-grabbing programs are key. Now in its second year, the index rates Canada 12th out of of 25 countries, a drop of five places from the inaugural report. “Canada has done all the right things. It’s just a matter of standing a little taller," says KPMG’s Colin Earp, national transport lead for Canada. The market for autonomous vehicles is expected to grow into the trillions of dollars in the coming decades. Countries are quickly adopting major initiatives, including dedicated communities for testing driverless vehicles in Singapore and plans to develop fleets of driverless freight trucks on highways, in the works between the Netherlands, Belgium and Germany. “If it ends up a huge global business, then being at the front of the queue in exporting to the rest of the marketplace – in terms of capabilities, innovation and infrastructure – is absolutely [a top priority]," Earp says. Canada’s advantages for developing autonomous technology include a highly skilled work force and leading work in artificial intelligence, KPMG found. The report ranks Canada tops for government-funded AV pilot initiatives, along with the Czech Republic, South Korea and Singapore, citing Ontario’s 10-year Automated Vehicle Pilot Program. And Canada rates second over all, behind Britain, for creating an open-data environment. But the country’s disadvantages include its massive size, icy winters and low national coverage for 4G digital networks. Infrastructure and a lack of EV-charging stations across the country contributed to the drop in the rankings, although KPMG pointed to the federal government’s $180-billion Investing in Canada Plan as having potential to improve transport. Canada also lacks attention-getting programs such as the top-ranked Netherlands’ truck-platooning plan – convoys of autonomous trucks driving together using 5G technology and networks of smart traffic lights. The report says Singapore, at No. 2 over all, leads in policy initiatives such as off-peak and on-demand buses and shuttles to be introduced in some districts by 2022. Singapore is also collaborating with the Netherlands to create international standards for AVs. Some believe that autonomous vehicles will largely be deployed in an on-demand transit role, rather than owned by individuals. The rankings take other factors into consideration. Private cars, for instance, are heavily taxed in Singapore. “Effectively, the pricing is done to discourage people from driving. That brings with it a whole set of opportunities” for AVs functioning as automated transit, notes Satya Ramamurthy, partner, head of infrastructure, government and health care for KPMG in Singapore. In Canada, Earp argues that some of the hurdles could be spun into advantages. Its climate could lead to leadership in adverse weather technologies. Perhaps the biggest question is the mindset of car owners toward their vehicles. There is an ingrained culture of cars as symbols of personal freedom to contend with. And the quandary: If the introduction of AVs reduces car ownership, with the vehicles used as on-demand transit, there will likely be less congestion, but if it increases car ownership, the roads will become more clogged, the report notes. The Netherlands: Retains its lead by doing many things consistently well, including investigating AVs’ use in freight and logistics, and passing new legislation. Singapore: The government is positioning the city-state as a centre for AV development through the deployment of a simulated urban test zone and plans for driverless buses. Norway: Following the legalization of AV testing in January, several cities now have driverless minibus services, and the country is also working on truck platooning. United States: Home to the world’s leading AV companies and a lot of testing work, but the lack of a strong national approach means individual states have to work hard to attract AV businesses. Sweden: Testing electric-charging roads, AV trucks and driverless buses, while working on revamped legislation for 2019. Finland: Focusing on getting AVs to work in winter conditions and automated bus services, and repainting the yellow lines on its roads to an AV-friendly white. United Kingdom: Supportive legislation and an increasingly co-ordinated national strategy address key barriers. Public trials are rolling out. Infrastructure remains a challenge. Germany: Has a national strategy for AVs and plans for using them ethically, but its federated structure, which can spur innovation in regions, may threaten consistency at the country level. United Arab Emirates: Boosted by good road quality and high consumer opinion of AVs, but does less well on data-sharing, AV businesses and patents. Japan: Performs well on innovation and infrastructure and sees a specific need for AVs from its aging population, but needs more deregulation and promotion. New Zealand: Strong government performance partly counteracts lack of scale and domestic manufacturing, and the country has opportunities in software and agriculture. Canada: Has a quality work force and strong government leadership, with Ontario allowing tests of fully driverless vehicles, but the country’s large size and remote locations may stretch AV infrastructure. The rest: 13. South Korea, 14. Israel, 15. Australia, 16. Austria, 17. France, 18. Spain, 19. Czech Republic, 20. China, 21. Hungary, 22. Russia, 23. Mexico, 24. India, 25. Brazil.